My "Piano Synergy #4" received a premiere on February 16 in Honolulu at Atherton Performing Arts Studio. 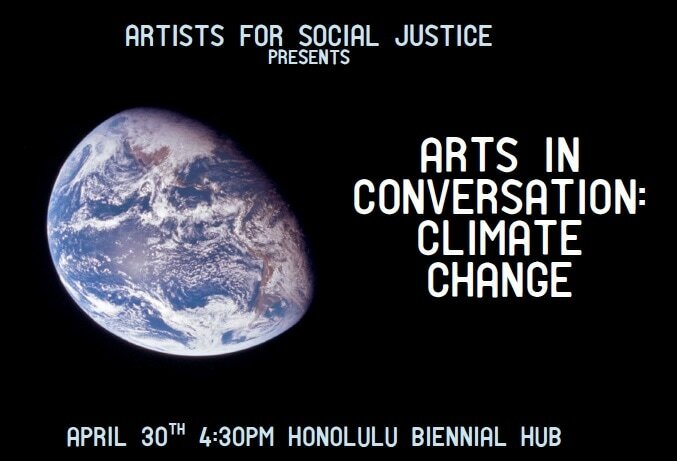 Next performance on March 3, 2019 at Maui Arts & Cultural Center's Castle theatre. ​My "Metaphor for guitar" received a performance on Maui, November 10. Thor Johannessen (Iceland) was the guiarist. ​Later in November, my "Piano Synergy #3" for solo piano received a performance in Seoul c/o Veritas Musicae. ​Also in November, William Anderson and Joan Forsyth performed my "Romance-Fantasy" for guitar and piano, in Gdansk, Poland. I completed "Enneagram" for piano on a ﻿​commission from Sarah Cahill (Berkeley, CA)﻿. My choral work with piano, "In the Night," received its premiere in Seoul, South Korea, on December 7, 2017. Veritas Musicae and Ebb & Flow Arts will step up cooperation. 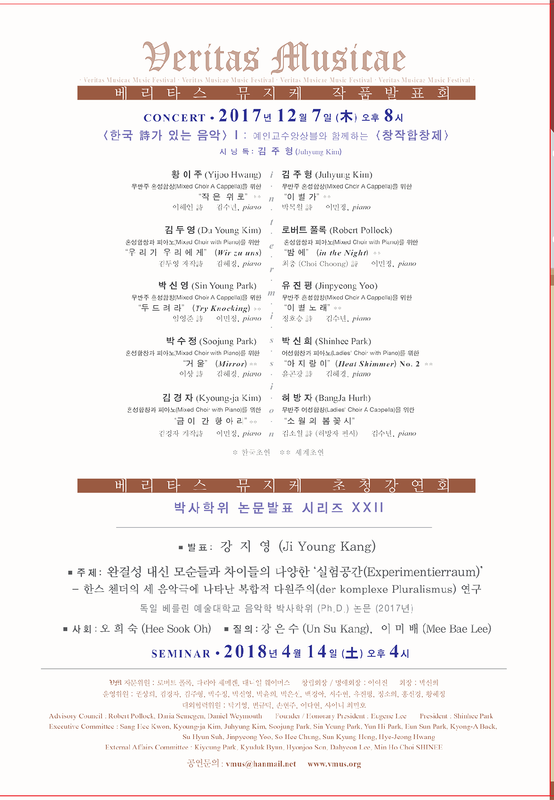 A concert in Seoul in November 2018, will include my new work for piano inspired by a Korean poem as well as woks by three other American composers. E&FA will help co-sponsor this event. With works by Robert Pollock, Agustin Castilla-Avila, Piazzolla, and William Anderson, and more. Composer Agustin Castilla-Avila was born in Spain, and now lives in Salzburg. Composer, Robert Emil Pollock, born in NYC, where he ran the Composers' Guild of New Jersey. He now lives in Maui, where he launched Ebb & Flow Arts. Guitarist/mandolinist/theorboist/composer William Anderson is based in New York City. Bill Anderson and Joan Forsyth performed my "Romance-Fantasy" for guitar and piano, on September 27 in Xalapa, Mexico, part of FIC21 2017, Dr. Emil Awad, director. On November 4, 2018, 8PM, at Berkeley Hillside Club, I performed my "Piano Synergy #1," as well as Shinhee Park's "Abstract Paintings No. 1" and Edward T. Cone's "Page From A Diary." Sarn Oliver with colleagues from SFSO, performed George Crumb's "Black Angels" string quartet. Also Sarn and I performed his "Plum Blossoms Floating." I offered a performance/lecture and masterclass at Sacramento State University on November 6, 2017, part of the 40th annual Festival of New American Music (FENAM). 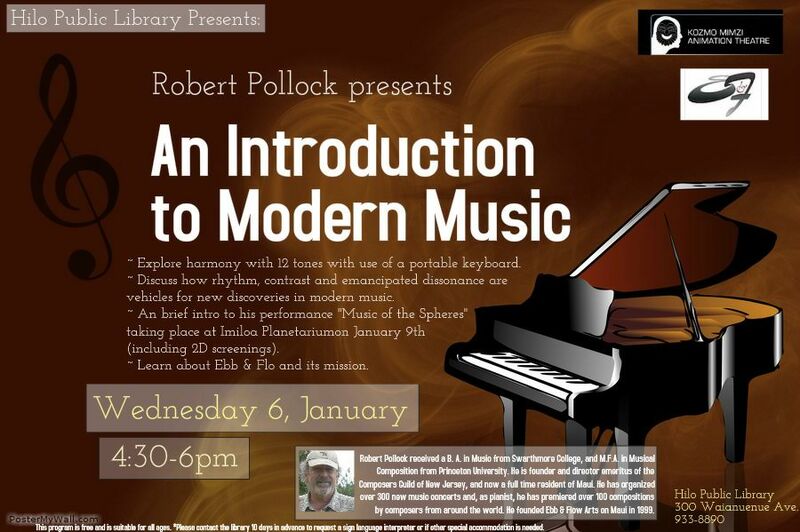 I gave two masterclasses to area piano students. I have received two commissions - one from pianist, Sarah Cahill, another from Music Teachers National Association. 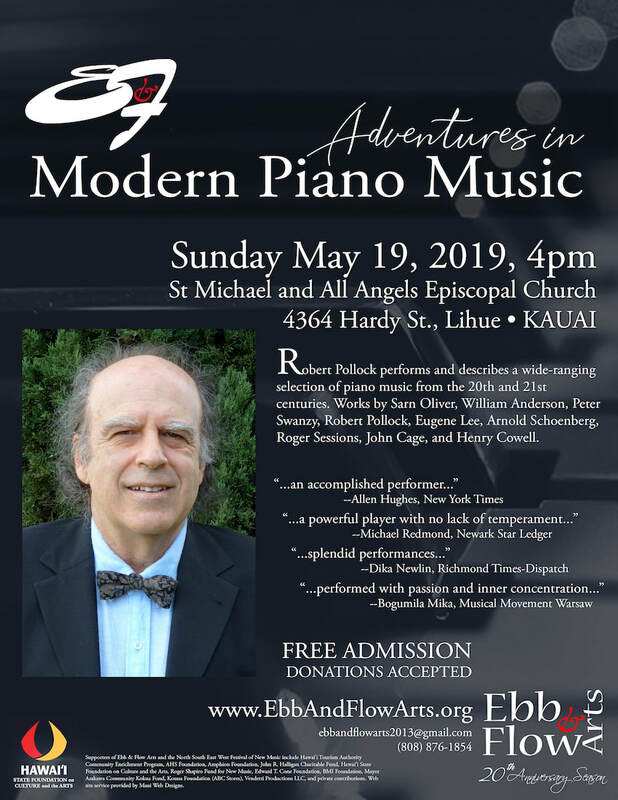 The latter piece, "Piano Synergy #2," received its premiere on November 17 in Honolulu, myself pianist (see slideshow above). I was also a judge for a piano competition produced by HMTA on October 29, 2017. I completed "Violin Synergy" for four violins. It received two performances on August 4 and 6, 2017, on Maui, by four members of the San Francisco Symphony, led by longtime colleague, Sarn Oliver. 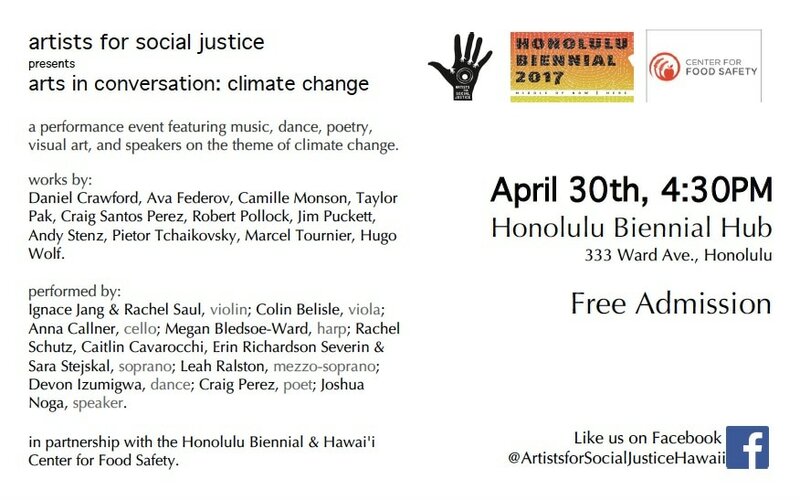 ​A performance of my "Contrast" for soprano and string quartet took place on April 22, at the Arts at Mark's Garage in Honolulu, featuring Rachel Schutz, soprano, Iggy Jang, violin, and others. My "Metaphor for Flute, Violin, Viola, and Piano" (2017) was premiered on March 5 at Maui Arts & Cultural Center. ​E&FA's new CD, "Explorations," includes my "Chamber Setting #2" for percussion ensemble. New Jersey Percussion Ensemble held the recording session for this work in 1993! We finally produced it in 2017. Nathaniel Lee, a member of the percussion ensemble at University of Georgia, organizes a premiere performance of my "Elements" for percussion quartet in Fall, 2017. It will be live streamed. I composed the 20 minute work while in transit from New Jersey to Hawai'i, completed on Maui, in 2000. Nathaniel also has recorded my "Metaphor" for vibraphone. In November, Veritas Musicae in Seoul, Korea, produced a concert that included my "Log A Rhythms, Volume 5" for piano solo. This performance is part of a thirty year and ongoing musical-cultural exchange between organizations that I lead and Veritas Musicae, founded by Dr. Eugene Lee, and currently directed by Dr. Shinhee Park. ​On Thursday, October 2, William Anderson and Joan Forsyth premiered my "Romance-Fantasy" for guitar and piano (2007) at the FIC21 2015 festival in Xalapa, Mexico. They performed it on Maui, July 31, 2016. I performed "Log A Rhythms, Vol. 6" at the same festival in a solo recital, September 30, 2015. On October 6, 2015, a house concert at the music studio of James Carmichael, Oakland, CA. ​It included "Log A Rhythms, Vol. 6". On December 6, 2015, Ebb & Flow Ensemble performed in Honolulu, including my "Two Pieces" for piano. On January 9, E&FA's mini-tour of Big Island concludes with our fifth installment of "Music of the Spheres" - electronic music with full dome digital film and 3D effects - at Imiloa Planetarium. Bill Anderson and Joan Forsyth performed my Romance-Fantasy for guitar and piano (2007) January 17 at the Winter Sonata Piano Seminar in Bennington, VT, and then on Feb. 12 at 3rd Street Music School in NYC. On May 22, 2016, at Queens New Music Festival in NYC, Vox n Plux performed my "Vulture" based on the poem by Robinson Jeffers. I have received a recent commission from Roger Shapiro Fund for New Music to compose film music. In addition, at the request of Tine Rehling, harpist, I am completing a trio for Danish musicians - saxophone, 'cello, and harp. In July E&FA will produce Piano Synergy Festival, July 29-31, on Maui. As a result, I have completed solo piano works, "Piano Synergy #1", and "Piano Synergy #2". These and my "Romance-Fantasy" will be included in the festival.